Bikaner is a regal city of Rajasthan that retains a certain rustic old-world charm with its beautiful palaces, forts and temples. It is located towards the north-west of Rajasthan, at a distance of 330 km from the capital city Jaipur and around 450 km from Delhi. Bikaner was founded by Rao Bika in 1488 and was formerly known as Jangladesh since it used to be a barren land filled with wilderness. The city has seen the rule of many powerful rulers such as the Mughal Empire, Mewar kingdom, Thakurs and of course the British Raj. Akshaya Tritiya and Teej are the two festivals celebrated with great grandeur at Bikaner. If you're living in Delhi, here's how you can plan a weekend road trip to the city of Bikaner. Since summer and winter are both quite extreme in Bikaner, the months of October to February are ideal to visit the city. The weather remains pleasant and you also get to witness the Camel Festival if you're here in January. Don't miss out on a camel safari during this time. Route 2 is preferable since it is shorter and has few interesting places to visit on the way. Check them out. Surajgarh is a town popular for an ancient fort that was built in 1780 by a ruler of Shekhawati, Maharaja Suraj Singh. Surajgarh literally translates to "castle of the sun". The fort, which is located 163 km from Delhi, has now been converted into a luxury hotel. So if you wish to experience a bygone era for a day or two, you can stop at the fort. Surajgarh Fort is known for its exquisite frescos, many of which were brought by ancient travellers. Located at a distance of 40 km from Surajgarh, the town of Jhunjhunu is mainly known for Khetri Mahal which is fondly known as the Wind Palace of Jhunjhunu. Built by Bhopal Singh in 1770, the Khetri Mahal was the result of an inspiration drawn from the magnificent Hawa Mahal of Jaipur. In an attempt to allow steady flow of wind, the palace has pillars in place of huge walls wherever possible. Mandawa is a town of stunning forts and havelis, that is located 30 km from Jhunjhunu. The Mandawa Fort was built by Vikram Samvat in 1812 and is beautifully decorated with frescos of Lord Krishna, a vibrant gateway and intricate carvings. Some of the havelis you need to visit at Mandawa include Ram Pratap Nemani Haveli, Murmuria Haveli, Sewaram Saraf Haveli, to name a few. Next stop is the final destination, Bikaner, which is located about 192 km from Mandawa. Formerly known as Chintamani, the Junagarh Fort is a huge magnificent fort that was built in the 17th century under the supervision of Raja Rai Singh's prime minister, Karan Chand. The fort is made of red sandstone and marble and has structural courtyards, kiosks, balconies, etc. Although attacked by the Mughals, the fort stands tall and strong till date. Built in a Indo-Saracenic style of architecture by Sir Samuel Swinton Jacob, the Laxmi Niwas Palace used to be the residence of the former king Maharaja Ganga Singh. It was constructed between 1898 to 1902 and was later extended to a larger Lalgarh Palace. The palace has now been turned into a luxury hotel so you can stay for a day or two if you wish to catch a glimpse into the royal lifestyle. Havelis were large traditional houses built centuries ago and the ones lined up in Bikaner are splendid examples of these structures. These havelis were named after Bikaner's most powerful families, the Rampurias. Built in red sandstone, these havelis showcase stunning architectural style. 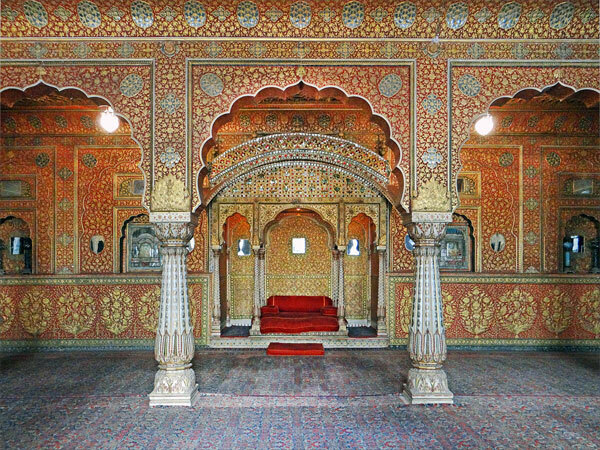 Walk through the streets of Bikaner and revel in the magnificent beauty of the Rampuria havelis. Dedicated to Karni Mata, this is a Hindu temple located about 30 km away from Bikaner. The popularity for this temple is gained due to the 25,000 rats that the temple is home to. Here, rats are considered highly auspicious; therefore, it is also known as the Temple of Rats. Sighting white rats are very rare but when you do, it is considered extremely holy since the devotees believe this to be the manifestation of Karni Mata and her four sons. Bikaner is home to several beautiful temples. Apart from the famous Karni Mata Temple, visit Bhandasar Jain Temple, Laxmi Nath Temple, Shiv Bari Temple, to name a few. The Bhandasar Jain Temple is dedicated to the 5th Jain Tirthankara, Sumatinatha. It is known for its stunning architecture of red sandstone, beautiful frescos and exquisite mirror work.